A typical Sunday morning (or afternoon depending on what time they crawl out of bed) for a New Yorker involves brunch. And what, perhaps, characterizes brunch in New York more than anything else is bagels, cream cheese and lox. However, few, if any, New Yorkers, I would guess, think about lox very much, probably because of its ubiquity, and are unaware of the age-old food tradition they have inherited. 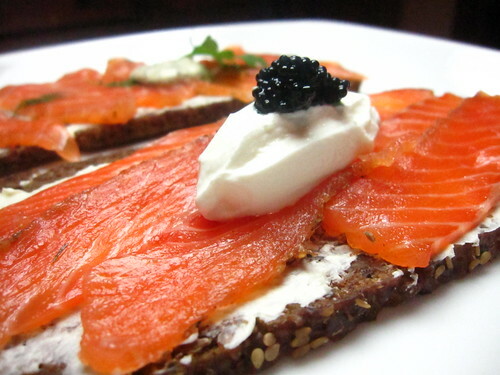 Popularized in the city by its large Ashkenazi Jewish population in combination with cream cheese and capers, lox or belly lox (from the Yiddish laks/lachs meaning salmon), is brine-cured salmon that is almost always served in wide, thinly-sliced strips. Crispy toasted bagels, soft, buttery cream cheese, tangy capers, and smooth, salty lox is a fabulous combination and is one of the few fish dishes I can stomach as my first meal of the day, especially after a few holiday beverages the night before. Growing up in England in the days before salmon farming, smoked salmon (as we called it) was so wildly expensive that we only ever had it at Christmas when my mother was feeling flush. It was only available in these posh-looking presentation packets emblazoned with a bold tartan that announced its esteemed Highland origins and you could rarely find it on the shelves at the delicatessen before early December. I remember my mother instructing me that I wasn’t to scoff it down like some ordinary fish, and under the watchful gaze of my grandfather, I’d sit and chew one small piece appreciatively around my mouth until it became an oily mush, before slyly coughing it into my napkin. To me, the whole thing wasn’t that it was to be enjoyed, but that it was expensive and I had to pretend to recognize its luxuriousness while being stared at by beady old eyes. Through the intervening years I’ve learned to chew it less and enjoy it more, but I still get that frisson of excitement whenever I order it, thinking myself a real grown-up now I can eat it whenever I like. I learned recently though that I hadn’t been eating lox as a young man at all, nor, for that matter, have I been eating smoked salmon since moving to America. And, I doubt it’s just me that is confused by the range of apparently similar salmon on sale in the store. I reckon that most New Yorkers, in spite of being connoisseurs of cured salmon, are largely ignorant of the differences between lox, Nova Lox, smoked salmon, and gravlax. It might have been Eastern European Jews that helped make it a weekend tradition in America, but curing salmon and serving it with bread, pickles and condiments is a practice found throughout Northern Europe where preparations and names vary from place to place. 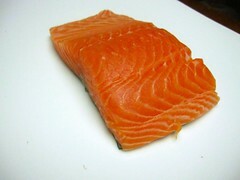 Generally-speaking, German and Czech techniques for lachs and losos respectively tend to mirror the brining commonly used in lox in the United States; Scottish recipes for smoked salmon eschew the brine in favor of a dry salt and sugar cure followed by a cold smoking; Nova Lox — from Nova Scotia — favors a combination of the Jewish and the Scottish, with a less salty brine and cold smoking; and the Scandinavian gravlax, gravad lax (Sweden), gravad laks (Danish), gravlaks (Norwegian), graflax (Icelandic), graavilohi (Finnish) is typically made using a dry cure sometimes augmented with akvavit (aquavit), vodka or brennevin (Icelandic caraway seed-flavored schnapps) and assisted with a heavy brick. 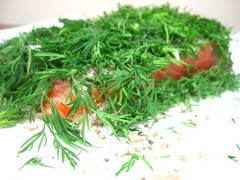 The derivation of the word gravlax (and its other Nordic cognates) actually describes the technique originally used to make it. “Lax” means salmon and “grav” means buried, and in the Middle Ages Scandinavian fisherman would salt freshly caught salmon and bury them in the sand just above the high tide mark. This would perform the dual function of keeping it moist and squeezing out excess moisture with the weight of the sand. In fact, the whole point behind making gravlax, or indeed any type of cured salmon, was originally to preserve it and allow you to eat it later. 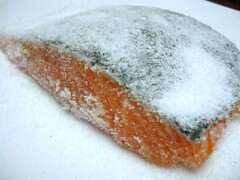 In the same way pork is salted to make salami or cured hams that last a long time, the salt in a gravlax cure removes the water in the fish via osmosis denying bacteria an environment in which to grow. 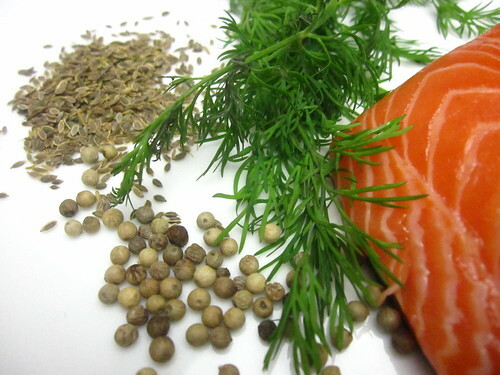 No one technique is better—lox, gravlax, etc.—they all produce very delicious cured fish, that is, in its own way, unlike the others, but we decided to focus on the Scandinavian method because we liked the sound of the varied and traditional herbs and spices (white pepper, caraway, juniper and dill) it uses, not to mention the high strength booze. In truth, all are very simple to make at home, even if you don’t have a stretch of shoreline to bury your fish in. And, in spite of the amount of salt used the result is very nuanced in flavor without being salty. Gravlax is highly versatile too—use it to make your own Yuletide Smörgåsbord (have a party with it! ), add it to your next bagel and cream cheese, make cute appetizers by adding a slice of cucumber to a cracker and topping it with a thin slice of gravlax, toss it in some cold pasta salad, or top your own arugula salad with a few slices. As long as you have room in your fridge and some patience, gravlax is worth a try. Merry Christmas and Happy New Year to all our readers! Yes, we mean you, mom. 1 brick or other heavy weight (filled cans, cast iron pan, etc.) – at least 4 lbs. 1. In a bowl, mix together the salt and sugar. Pat your salmon filet dry with a paper towel. Place your salmon on a plate and brush on the aquavit/vodka. Do not saturate it, just put a very small amount on the flesh and rub it in. 2. Cover the salmon with the salt/sugar mixture. Turn over and rub in the salt/sugar mix on the skin. Again, turn the fish, skin side down. Allow it to sit out at room temperature for about a half hour or so, allowing the salt/sugar mixture to begin to penetrate the salmon. 3. Crush the white peppercorns (do not grind) by placing them in a plastic baggie and smashing them with the back of a pan, meat tenderizer or rolling pin. 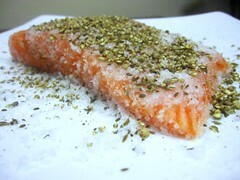 Cover the salmon flesh with the crushed white peppercorns. If you are using dill seeds, do the same with the them. 4. 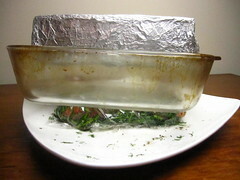 Cover the salmon with the fresh dill and cover the salmon tightly with plastic wrap. 5. Now it’s time to weight down the fish. Using your weight of choice (I used a glass pan with a brick wrapped in tin foil on top of it), put the weight on top of the fish. Put in the refrigerator and allow to cure for at least 48 hours and up to four days. Every 12 hours you will want to flip the salmon, drain some of the liquid that may have accumulated on the plate and place the weight back on to the salmon and place back in the fridge. Repeat until you are ready to eat. 6. 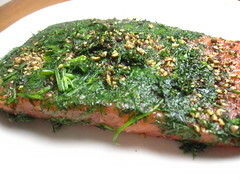 When it is time to slice the salmon, remove all the dill and excess pepper. Take a sharp (and I mean sharp) knife and cut thin slices. 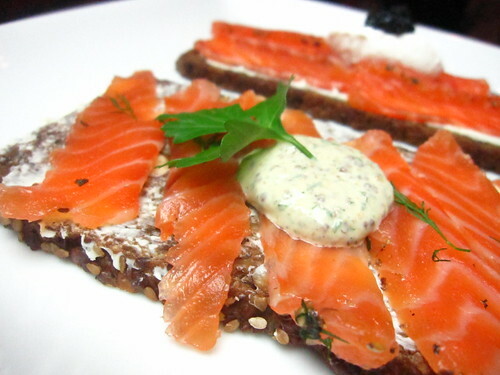 If you are interested in doing what we did, butter some thin-sliced bread (pumpernickel or dense rye) and top with the gravlax and some sour cream or traditional mustard-dill sauce. Yes, it used to be such a splurge, and the Scottish stuff still is. Great little recipe for doing it at home. Have a good one! I love me some gravlax! And a Merry Christmas to you as well! @Deana: it really still is. It’s a question of wild vs farmed fish but I, for one, believe strongly in sustainable aquaculture. If more of our fish was sustainably harvested in one way or another, much of the guilt of being a foodie would disappear. Thanks for being a loyal read. Hope you had a great Christmas! @Elizabeth: Merry Christmas to you too! Hi guys. Happy New Year. and Happy smoked fish! I love lox, sable, smoked herring, whitefish, you know the drill. Just drop me off at Russ & Daughters. I made this last year with Seattle salmon and it came out great! the hard part was slicing it for me. I made half of a whole salmon using a similar method a few years ago. I know it had a dry rub of brown and white sugar and salt, but I can’t remember what else besides vodka. I had to use sheet pans because of the size and it took a couple of days at least in the fridge. I took it to a big party and it was well loved! We recently saw a new recipe somewhere and plan to make it soon. Nothing like making your own. ps. Thanks also for your effort in using proper Scandinavian letters ä, ö & å! @Anna from Finland: kiitos for visiting and the kind words! (and there is the extent of my Suomalainen) We do our very best always to try to be as authentic as possible in our research, ingredients, and the way we describe the food. The internet is full of rubbish, half-assed food, and while we don’t post very often, we try to make sure that what we do post is as good as we can make it.